For deliveries outside the UK please contact us for a delivery quote. The first barometers were made by skilled cabinet-makers, glass-blowers and makers of clocks and scientific instruments. Patient, dedicated craftsmanship is still employed at Russell Scientific Instruments, assisted by modern methods and equipment where appropriate. Many of the instruments in the Russell Collection are built to long-established patterns and designs. 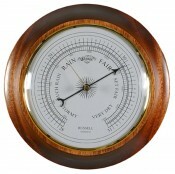 Whether you are looking for a classic instrument for a gift or decorative purposes, or for more serious weather forecasting, we are sure that you will find the perfect instrument in this collection of fine barometers. All mahogany comes from sustainable sources. Finishes and dials can be varied to suit customer requirements.